Abbington Green Bed & Breakfast Inn, Asheville NC: Abbington Green Bed & Breakfast: It's Not a Plume. It's Not a Poppy. But it IS a Plume Poppy! Abbington Green Bed & Breakfast: It's Not a Plume. It's Not a Poppy. But it IS a Plume Poppy! Yes, no kidding. 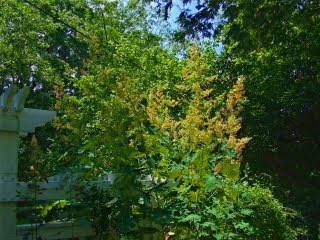 This very interesting plant can be found in North Carolina and in our gardens at Abbington Green Bed & Breakfast Inn. 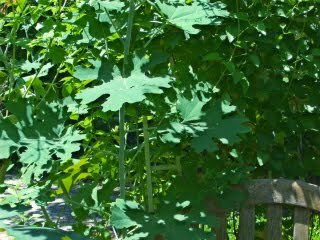 It's called "Plume Poppy" also known as maclea cordata It's a perennial and grows to be very tall...8 feet or more It spreads quite rapidly when it's happy which also can make it a good cover for a steep embankment. Thinking that it might take over the world? The good news is: it's also easy to pull out , if it is expanding too fast for your garden plan. 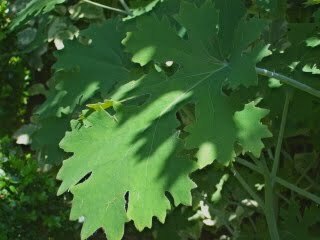 What makes Plume Poppy an outstanding contributor in our garden is its height and that it has great foliage. Interesting shaped, large leaves that are silver-green on the back get a lot of comment from our guests. The tiny flowers create the" plume". They are pale peach on this one and wave beautifully in the breezes. Asheville, NC is a place you can find Plume Poppy, including here at the bed and breakfast.